Fifa plans to amend World Cup bidding rules by banning countries from investing in overseas football development projects. Football's world governing body will also demand bidding nations adhere to United Nations standards on human rights and labour laws. Swiss prosecutors are investigating the Russia 2018 and Qatar 2022 awards, with both denying any wrongdoing. The bidding process for the 2026 World Cup has also been postponed. The existing clause, which mandated all countries wishing to stage the World Cup to pump money into the game outside their own borders, will be scrapped. Bidding nations will not be allowed to spend money overseas both prior to, and after, any vote. Fifa sources have acknowledged that the regulation increased the risk of corruption. Who is in line for 2026? The USA are front-runners to stage the tournament, but Canada, Mexico and Colombia are also thought to be interested. The vote to decide who will host the 2026 World Cup is due to take place in Kuala Lumpur in May 2017. England's bid to host the 2018 World Cup - which ended in humiliating failure in December 2010 - involved several attempts to secure the vote of Jack Warner and other prominent executive committee members, by investing in development programmes around the world. 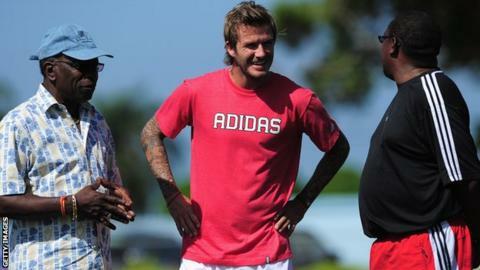 It led to England playing a friendly match in Trinidad, promises of a similar game in Thailand - subsequently scrapped after the bid only secured two votes - and saw former England captain David Beckham fly to the Caribbean to court Warner and his associates. Warner was among 14 football officials charged by US authorities in May in relation to money laundering and bribery over TV and marketing rights. In light of that investigation - which led to Fifa president Sepp Blatter announcing he would leave office - the race to stage the 2026 World Cup was suspended. When it is eventually restarted those nations bidding to host the tournament will now have to abide by UN standards on labour laws and human rights. The move echoes a similar stance taken by the IOC in relation to hosting the Olympic Games. It also reflects the concerns expressed by human rights groups over conditions for foreign workers in Qatar, which will stage the World Cup in seven years. That World Cup, and the one due to be played in Russia in 2018, remain under investigation by Swiss authorities looking into 81 suspicious bank transactions relating to the bidding race. Both tournaments were awarded in tandem in 2010. Meanwhile, Blatter is continuing to prepare for Monday's extraordinary executive committee which will decide the date for the fresh presidential election and which reforms to adopt, following the outgoing Fifa president's promise to transform the organisation before he leaves. On Thursday, Russian sports minister Vitaly Mutko confimed Blatter would be attending the 2018 World Cup preliminary draw in St Petersburg later this month, according to local media. Why doesn't Britain love Chris Froome? Read more on Why doesn't Britain love Chris Froome?